Not to be confused with Gaiwan. A chawan (茶碗; literally "tea bowl") is a bowl used for preparing and drinking tea. Many types of chawan are used in East Asian tea ceremonies. The choice of their use depends upon many considerations. The chawan originated in China. The earliest chawan in Japan were imported from China between the 13th and the 16th centuries. The Jian chawan, a Chinese tea bowl known as Tenmoku chawan in Japan, was the preferred tea bowl for the Japanese tea ceremony until the 16th century. 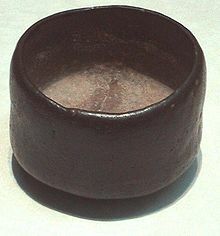 In Japan, tea was also mainly drunk from this Chinese variety of tea bowls until about the 15th century. The Japanese term tenmoku is derived from the name of the Tianmu Mountain, where Japanese priests acquired these tea bowls from Chinese temples to bring back to Japan, according to tradition. By the end of the Kamakura period (1185–1333), as the custom of tea drinking spread throughout Japan and the Tenmoku chawan became desired by all ranks of society, the Japanese began to make their own copies in Seto (in present-day Aichi Prefecture). Although the Tenmoku chawan was derived from the original Chinese that came in various colors, shapes, and designs, the Japanese particularly liked the bowls with a tapered shape, so most Seto-made Tenmoku chawan had this shape. 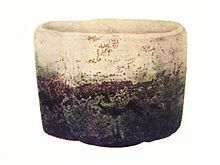 With the rise of the wabi tea ceremony in the late Muromachi period (1336–1573), the Ido chawan, a variety of Korean bowls mainly used for rice in Korea, also became highly prized in Japan. Korean bowls were a favourite of tea master Sen no Rikyū because of their rough simplicity. Over time and with the development of the Japanese tea ceremony as a distinct form, local ceramics became more highly priced and developed. Around the Edo period, the chawan was often made in Japan. The most esteemed pieces for a tea ceremony chawan are raku ware, Hagi ware, and Karatsu ware. A saying in the tea ceremony schools for the preferred types of chawan relates: "Raku first, Hagi second, Karatsu third." Another chawan type that became slightly popular during the Edo period from abroad was the Annan ware from Vietnam (Annam), which were originally used there as rice bowls. Annan ware is blue and white, with a high foot. ^ Kodansha encyclopedia of Japan, Volume 2. Tokyo: Kodansha. 1983. p. 25. ISBN 978-0-87011-622-3. ^ "Jian ware". Encyclopædia Britannica. Retrieved 4 December 2011. ^ a b Tsuchiya, Yoshio (2002). The fine art of Japanese food arrangement. London: Kodansha Europe Ltd. p. 67. ISBN 978-4-7700-2930-0. ^ "Tea bowl (China) (91.1.226)". Heilbrunn Timeline of Art History. New York: The Metropolitan Museum of Art. October 2006. ^ Bushell, S.W. (1977). Chinese pottery and porcelain. Kuala Lumpur: Oxford University Press. ISBN 0-19-580372-8. ^ a b Ono, Yoshihiro; Rinne, Melissa M. "Tenmoku Teabowls". Kyoto National Museum. Retrieved 26 November 2011. ^ Sadler, A.L. Cha-No-Yu: The Japanese Tea Ceremony. Tokyo: Tuttle, 1962, 67. ^ a b "Korean tea bowls imported to Japan" (in Japanese and English). Miho Museum.